This apartment (Unit #8 at the Beach House) is located in the rear of the first floor of our 10th St property and is a very small efficiency apartment. It has a queen bed, a very small sitting area, small kitchenette, flat screen TV, and bathroom. The apartment (Unit #9 at the Beach House) makes up the majority of the first floor of our 10th St property and is a 3 bedroom 2 bath apartment with a large one room living room / kitchen area and great front porch. Bedroom 1 & 2 both have queen beds plus bunl-beds, and bedroom 3 has a queen bed only. There are 2 reserved parking spaces and a shared laundry facility. Although this unit is still owned by BeachHouseOC it is now professionally managed by Vacasa and all reservations must be made through their site at www.vacasa.com/unit/15873. When booking through Vacasa there is only a 2-3 night minimum and you are provided all linens, blankets, towels, soaps, etc. If you prefer to stay in a property still managed by BeachhouseOC please check either Talbot St or 5th St locations. 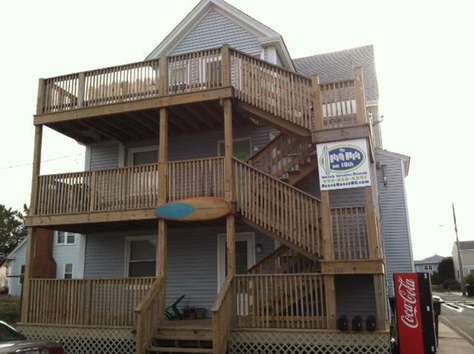 This apartment (Unit #10 at the Beach House) makes up the second floor of 10th St and is a 3 bedroom 2 bath apartment with full sized kitchen and great front porch. An inside locking stairway connects to unit #11 which can be opened up to combine the two units. Although this unit is still owned by BeachHouseOC it is now professionally managed by Vacasa and all reservations must be made through their site at www.vacasa.com/unit/15874. When booking through Vacasa there is only a 2-3 night minimum and you are provided all linens, blankets, towels, soaps, etc. If you prefer to stay in a property still managed by BeachhouseOC please check either Talbot St or 5th St locations. The apartment (Unit #11 at the BeachHouse) makes up the third floor of 10th St, and is a large 1 bedroom 1 bath apartment with full sized kitchen and great front porch with distant views of the ocean and bay. An inside locking stairway connects to unit #10 which can be opened up to combine the two units. Although this unit is still owned by BeachHouseOC it is now professionally managed by Vacasa and all reservations must be made through their site at www.vacasa.com/unit/15875. When booking through Vacasa there is only a 2-3 night minimum and you are provided all linens, blankets, towels, soaps, etc. If you prefer to stay in a property still managed by BeachhouseOC please check either Talbot St or 5th St locations.